maemo.org - Planet maemo: category "feed:ed5327111cb3ef2ef4baa89aa50ad3f0"
Whoa. I’m going to Dublin to MeeGo Conference! That’s it. I claim my GSoC10 project finished. And what did I actually do? I coded like a mad person at times, slept much too little, found myself in odd places, took some time off and did nothing related to my project, swam in the sea of despair, learned a lot and had fun. The application is not in all parts what I planned it to be and in some parts it’s more than I expected. Now the version 1.0 is in extras-testing. It would be nice to hear some testing reports, the bug tracker can be found in GitHub . Hopefully soon enough I’ll have the opportunity to just lay back and watch people going on their adventures. 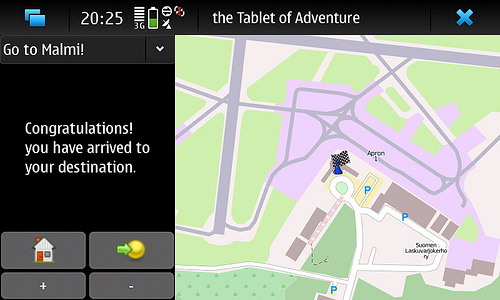 A short introduction to the application can be found in the tab the Tablet of Adventure. 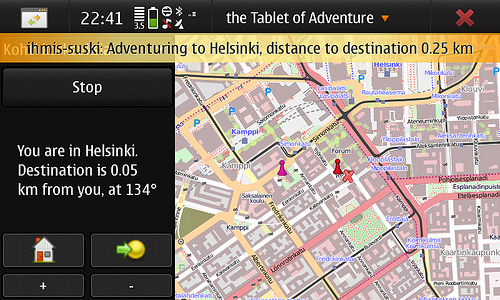 Although the GsoC10 project is finished, the work with the Tablet of Adventure is not. I have couple of ideas of how I could make my software more versatile. And then there will be the versions. First an Ubuntu desktop version, so you can watch where your friends are going. And if I get to an agreement with my University I’ll make my software run on Android too. And so on. This was only the beginning. The project is nearing it’s end. Social features are forming up, the UI is getting more refined forms and the amount of rows in my code is building up. At this point in my code I’m making things work rather than making the code look good. There is some refactoring ahead. The program itself has gotten an adventure editor, where you can form your own adventures. Click on the map and a headline and you are on your way. In settings you can change your buttons colour and soon enough you can read comments and see where other participants are. The next release will probably happen during the weekend. Before that it’s work work work and no play. I established a page on Maemo wiki for my project. I’ll update features there as I go along. I’ll blog about major changes. I have been testing my application with hardcoded missions. My brand new license to drive a motorcycle has been a brilliant aid in testing. Motorcycle is a fast and convenient way to get to places. Every visit to a friend or a beach has been altered to a mission. As I test the app, it gets more features as I notice what works and what doesn’t. The formerly enormous battery usage has been diminished to reasonable battery usage. Distance to destination gets more precise when you become nearer the target. The program has an ending, small checkered flag with congratulations when you reach your destination. Map and some despair with bearing. One evening and the map works. Two whole days and I still cant get bearing calculation working. Mathematics is definitely not my strongest area. I think I’m calling in the medics with the mess of calculating bearings. I originally thought I would use PyQt but as it turns out, there is no map widget available for that on Maemo. 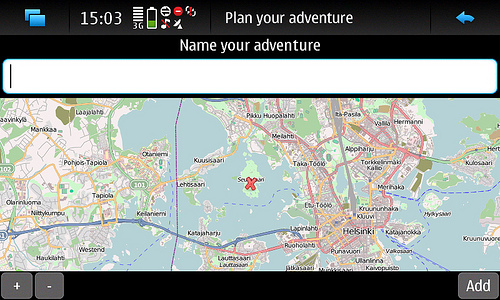 So PyGtk and osm-gps-map it is, the map widget is already being used in other Maemo applications. My mentor contacted the osm-gps-map team and they were nice enough to verify that their widget can support custom CloudMade maps. This means I will be able to design a map style that fits the spirit of my application. Next week I’ll be concentrating on minor details and organizing an event for nearly 600 persons. After that it’s an intensive week wrapping this up for midterm evaluation. Last couple of weeks have been really busy. I have been dividing my time with work for my application and work for University. The last exams and essays are over and done with. Now I can concentrate fully to my coding. My coding has been a deep plunge to Python and mathematics. Understanding the principles with the xkcd geohashing algorithms and researching for geographical tools and methods. Google has been a dear source for me lately. It’s knowledge I need and search engines give it to me rather easily. I have also raided a couple of my friends offices out of their books on Python and Qt. During this time I’ve been working with my assigned project mentor quite a lot, getting help with some obstacles that had gotten me stuck. I established an Github repository for my project. I’ll be sharing and managing my code there from now on, so you all can go and take a look of what I’m coming up with. At this point there isn’t that much, but I have a lot of things brewing in my mind. Geohash algorithm, Midgard, location(partly), distance between points, checking for internet connection. Tablet of Adventure: some drawings and initial design. As the first task in my GSoC project I have designed the outlook of my program with Balsamic Mockups. I’m trying to come up with screen mock-ups of every possible using situation. Having a clear set of pictures of every single screen I will encounter helps me to grasp actually what am I about to do. Having these sketches it’s easy to proceed to the next phase which is creating these with Qt Creator. The first screenshot after splash screen will be this. The program will automatically count current day’s Geohashing coordinates and show it on your map. In the top left corner it shows the date. Because the coordinates are constructed using the Dow Jones opening, depending on the timezones you might be able to take a sneak preview of tomorrow’s coordinates. Under the date there is a box telling you what is the distance from where you are standing to the Geohash. It also tells you to what direction you should be going. The final information in the box is on what terrain the coordinates are in if we’re able to get that from OpenStreetMap. On the bottom there are two icons. A tiny house and a flag. By clicking on the house, the map will show where you are, and the flag your destination. By clicking on the book icon in the lower right corner you get an access to your log. While you are on your way, the book will be just a place to write down information. When you reach your destination the icon will turn into a checkered flag informing you that you have reached your destination. 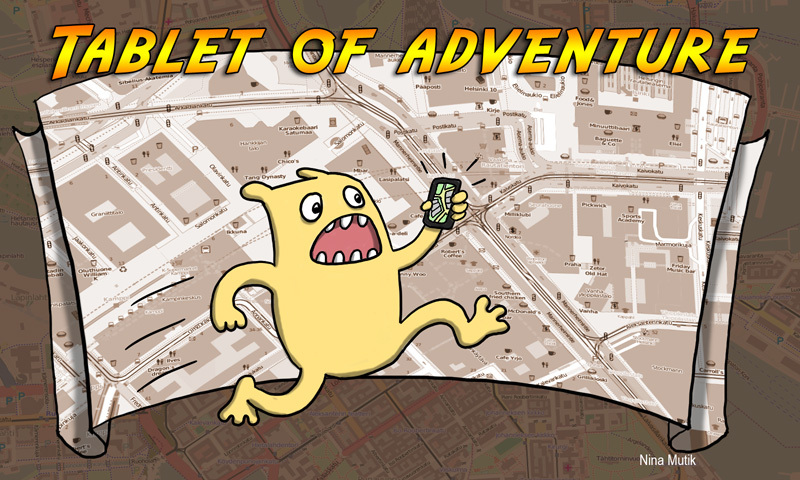 So, my project the Tablet of Adventure – a location-based social adventure game, got accepted as a part of Google Summer of Code for Maemo. And this time ‘flip bits, not burgers’ really came true, my other summer job option being a local burger joint. Oh lucky me. The program would be written in Python and developed out in the open using the Maemo garage or GitHub. Libraries utilized in the project include libchamplain for map visualization, Midgard2 for storage and GeoClue or liblocation for user location. Since I have been planning this application I’ve stumbled upon few very interesting articles about location-based software. SCVNGR has the idea where you just don’t share your location, you can do more. Users can make small tasks for each other. I think that is a brilliant idea. There would be use for something like this in my application, but I think that will be left for future development of my application. And SCVNGR has one other aspect they are right on the money with: why rely on one person to come up with ideas and implementations when you can have an whole lot of people inventing an involved in the process. Another idea that makes my B-rated movie fan heart jump out of joy: Being chased by zombies on my way to lectures. Perhaps the implementation is not the best in the world, but I just love the idea. If you had the chance wouldn’t you spice your life with a healthy dose of adventures?